The grill entrance is down the street from the better known steakhouse. If you’ve been following the blog for any length of time you know that I’ve got a thing for burgers. That’s not unusual – most foodies I know have a thing for burgers. 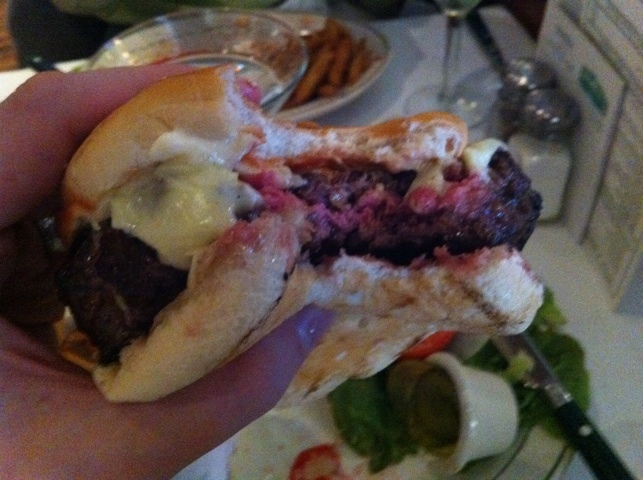 I even did a round-up of the best burgers in NYC for CBSNewYork.com. 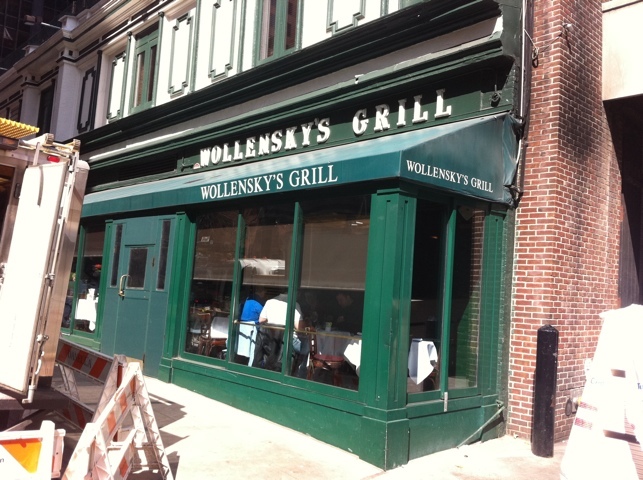 In that column I mentioned what I’m about to get into detail about here: Wollensky’s serve up a serious burger that is probably much overlooked. The bar area evokes Art Deco charm. It’s had not to like the smallish grill space. It’s divided into a number of different seating zones: some by the window, some in an elevated area near the bar, and more in the back. 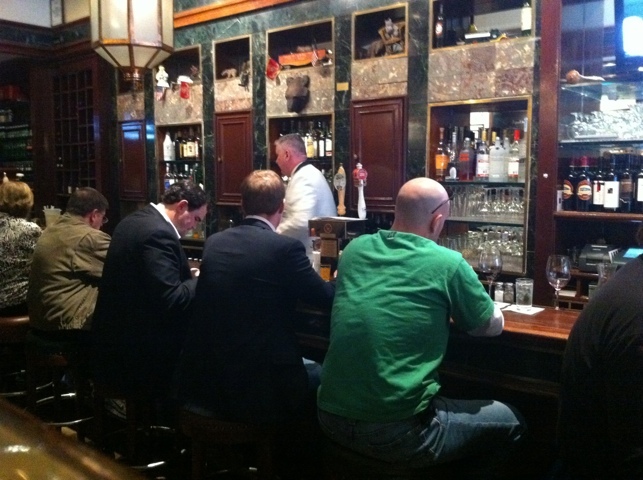 The gentleman behind the bar wears an old-school uniform. The green marble, the wood – it hits the right notes. It's practically obligatory, after all... . 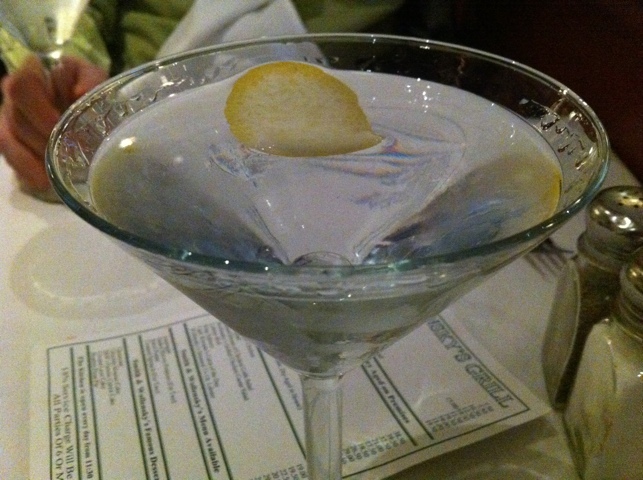 They know how to twirl a nice martini at Wollensky’s, which as you know is something I appreciate. But let’s get on to the reason that we came here: the burger. What you get for $17.50. First of all, it’s not cheap: it clocks in at $17.50, which as far as I know makes it one of the more expensive burgers in town. For that you get the cheeseburger and a chef’s toque full of fries, some lettuce, tomato, onions and pickles. So at that price point, it had better be pretty damn good. Take a good look: you can see the secret. So what is it about the burger that makes it worth it? Look at the picture above closely. See the dark rind on the patty? That bark is what does it. When you bite into the burger, that bark crunches hard for an instant before dissolving, and you discover that the choice meat within is perfectly prepared. Just look at those colors. There’s that hard, crunchy (and delicious!) bark around the edges, and the middle is the perfect medium-rare purple/pink. These guys know how to prepare a burger. The bun isn’t much to write home about – it adds a sweet and then smushes almost immediately. In the picture you can see the juices running into it. The cheese adds a fat to the flavor. But that bark, that crunchy bark followed by the give of juicy beef – it is a winner. The home fries are serious. The fries that come with the burger weren’t very impressive to me. They were somewhat smushy, although I did get a kick out of the toque presentation. 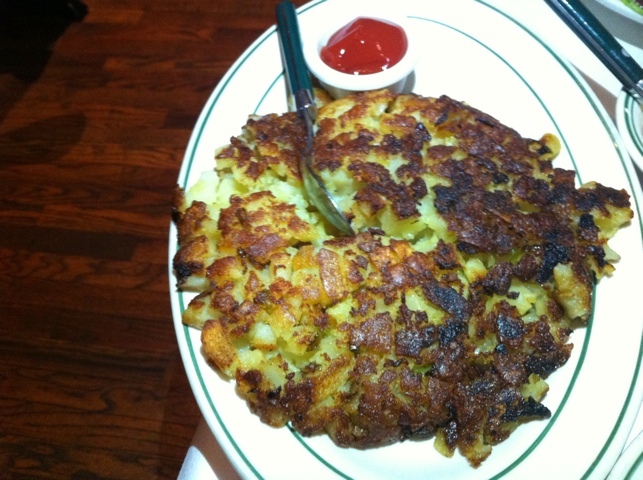 For our potatoes, we got the hearty and awesome home fries. They have a big onion flavor, plenty of butter and some grease. They seem like a great cure for a hangover, or to serve with some eggs for breakfast. Look, all in all I am a big fan. It’s not cheap, this place. $17.50 is a lot to ask for a burger. But the beef is choice, the bark is unlike anything elsewhere, and the best part about it is how it crunches then gives while not losing its beefiness. There’s craft in that technique. The bigger issue is that you come, you have a martini, you get your burger, maybe you have another martini, maybe a beer, and before you know it, you’re spending some bucks. Be warned on that score. But it is a good time, and a great burger. ← It’s A Long Way To Get To Zum Stammtisch From Manhattan, But If You’re Looking For Good Beer And A Good Time… . 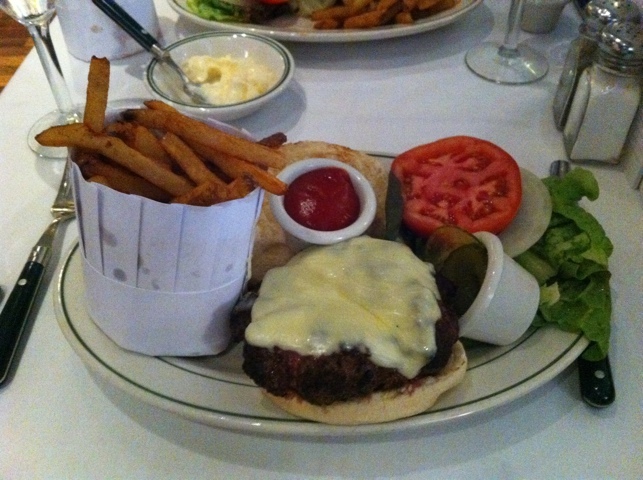 Have you tried the $30 burger at db Bistro Moderne? It’s a modernist medley of meats, fois gras, and truffles, and, imho, worth the price. Actually, a db Bistro Moderne review will be coming soon – stay tuned. I have indeed had it, and one day will probably give it a write up. However if I am honest about it, I recall thinking of it as a waste of a trip. 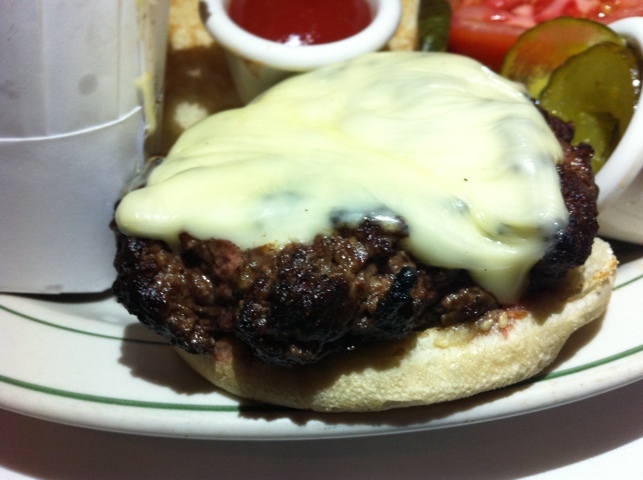 You go all the way out to the sublime Peter Luger’s, and you do indeed get a quality burger. But why would you get a quality burger there when you could get a peerless steak? I recall it being a fat, crumbly ball of delicious beef… but not up to the snuff of their steak. BTW, review of Luger’s (as though it needed it) to come.